ASHOQEH, Afghanistan — When a bomb exploded under Dan Luckett's Army Humvee in Iraq two years ago — blowing off one of his legs and part of his foot — the first thing he thought was: "That's it. You're done. No more Army for you." But two years later, the 27-year-old Norcross, Georgia, native is back on duty — a double-amputee fighting on the front lines of America's Afghan surge in one of the most dangerous parts of this volatile country. Luckett was a young platoon leader on his first tour in Iraq when an explosively formed penetrator — a bomb that hurls an armor-piercing lump of molten copper — ripped through his vehicle on a Baghdad street on Mother's Day 2008. His Humvee cabin instantly filled with heavy gray smoke and the smell of burning diesel and molten metal. Luckett felt an excruciating pain and a "liquid" — his blood — pouring out of his legs. He looked down and saw a shocking sight: his own left foot sheared off above the ankle and his right boot a bloody mangle of flesh and dust. As his plane touched down at Andrew's Air Force Base, he made a determined decision. He was going to rejoin the 101st Airborne Division any way he could. For the first month at Washington's Walter Reed Army Medical Center, Luckett was bound to a wheelchair. He hated the dependence that came with it. He hated the way people changed their voice when they spoke to him — soft and sympathetic. "They were like, 'You gotta' give the leg back,'" Luckett said of his therapists. After a brief argument, they grudgingly gave in. "They said, 'If you're gonna be that hard-headed about it, do it smart, don't wear it all the time.'" He rejoined his unit at Fort Campbell, Kentucky, and told his battalion commander he wanted to return to duty "only if I could be an asset, not a liability," he recalled. The region around his outpost at Ashoqeh, just west of the provincial capital of Kandahar in southern Afghanistan, is surrounded by irrigation trenches and 4-foot (1.2-meter) high mud walls that grapes grow over. Troops must traverse the treacherous terrain to avoid bombs on footpaths. 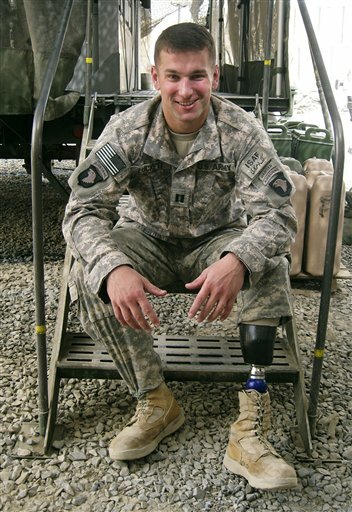 Beside his cramped bunk-bed, the 185-pound (84-kilogram), 5-foot-11 (1.80-meter) Luckett keeps prosthetic legs for different tasks, each with a carbon fiber socket that attaches to his thigh. Luckett's prothesis is often a source of good humor — most often generated by Luckett himself. Some joke of his advantage of having little to lose if he steps on a mine. "That's always a big one," he said, "but the reality is, you don't want to step on an IED (bomb) because you enjoy living and you want stay living. 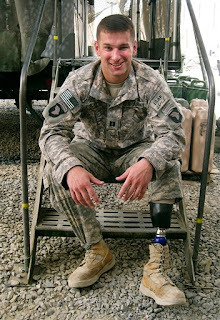 The fear is no different than any other soldier."